← Make a Difference During Thanksgiving Dinner! Hey Undergrads! We are still accepting submissions for our annual (en)Gendered Juried Art Exhibition. The (en)Gendered exhibit is a wonderful opportunity to show your art work to a larger audience and reflect on important topics. When it comes to examining the fluidity and complexity of gender and sexuality in society, there is perhaps no better view than through the lens of art. This year’s theme is “Words and Works: Dialogues in Intersectionality.” The theme is meant to allow space for multiple interpretations and readings and we welcome creative readings of the theme. Submissions could be about Gender and Language; Artistic, Intellectual, and/or Physical Production; Intersections of Public and Private Identities; Borders; Politics and Public Policy; Rhetorics of Race; Class, Gender, and Culture; or even Place, Space, Environment and Geographies. Have fun exploring all of these possibilities! Any undergraduate student can submit, regardless of major. This is a wonderful opportunity to have your work in a juried exhibition. If you are worried that your work will not fit in with the theme, chat with your professors about your work and bounce ideas off of your classmates. There is no submission fee and SBAI is open to work in all media – printmaking, video, drawing, digital art, sculpture, painting – feel free to submit all types of visual art! Submission forms are available at Sage Art Center, and submission drop off is also at Sage. 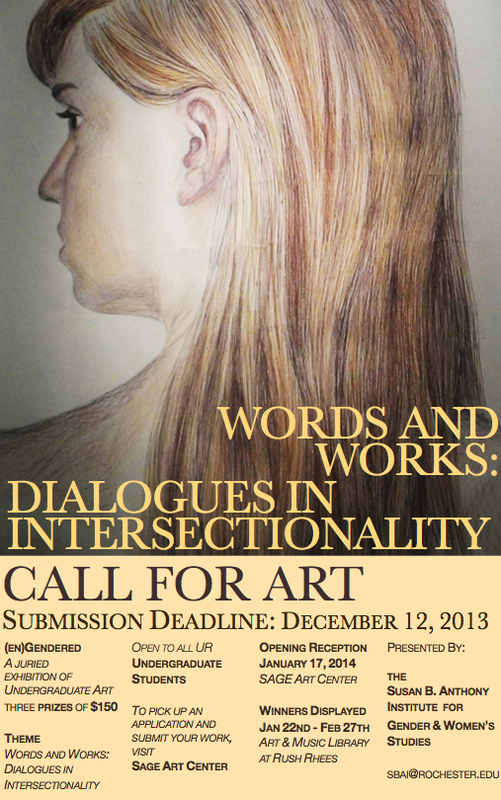 We have extended the submission deadline to Thursday, December 12th, 2013. We sincerely hope that you submit your work to this year’s show! Pick up submission forms and submit work at Sage Art Center.